The Minister of Commerce and Industry of Liberia, Professor Wilson K. Tarpeh, has vowed to ensure that Liberia does not become a dumpsite for elements who believe in unscrupulous business practices. Minister Tarpeh told a news conference at the Ministry’s conference room Wednedsay, January 30, 2019, that the Commerce Ministry will always be on the alert to ensure that the heath of Liberians is not endangered through harmful activities in the country’s business sector. Professor Tarpeh gave the assurance when the Ministry of Commerce and Industry, in collaboration with the Ministry of Health formally released the outcome of a recent test done on a consignment of contaminated pig feet brought into Liberia by a local importer of frozen food items, Cheaitou Brothers Incorporated. Cheaitou Brothers has one branch in Red Light, with another located in Logan Town, Bushrod Island in Monrovia. “You will recall on January 16, 2019, we invited all of you here to officially inform the public and the international community that the Liberian Government, through the Ministry of Commerce and Industry, quarantined a consignment of contaminated pig meat on the local market,” Professor Tarpeh told the gathering. He said the Commerce Ministry was able to quarantine 2,754 barrels of the pig feet that were brought into Liberia by Cheaitou Brothers Incorporated located in Red Light. The Commerce Minister noted further that sample of the suspected pig feet was taken to the National Standards Laboratory in Monrovia for testing, with the test results backed by international peer review. “We wish to re-state that our decision to quarantine the pig meat was based on an earlier alert issued by the European Union to the Ministry of Health, that a business house in Liberia was bringing in a consignment of contaminated pig-feet from a slaughter house located in Europe, Minister Tarpeh told the press. The European Union’s surveillance on the pig meat showed that it contained Salmonella Poison. He said upon the issuance of the worldwide alert by the European Union, the Ministry of Commerce and Industry immediately informed its Inspectorate Unit of the Alert. “The purpose of today’s Press Conference is to give you the outcome of the test that was conducted by our technical team at the National Standard Laboratory,” the Commerce Minister added. He continued by saying that the test results showed that majority of the samples of the pig meat submitted for testing were contaminated with Salmonella SPP. • B5 July- 866 were analyzed for yeast and mold and Salmonella Spp. • (B1 July-862, B2 July- 863, July-864, B4 July- 865 and B5 July-866) detected for Salmonella Spp. • While a sample (B1 May -860) detected for yeast and mold. • Sample coded – B1 August- 861 shows no detection of Salmonella, yeast or mold. Minister Tarpeh, during the press conference re-iterated that the greatest interest of the Liberian government, especially under the watchful eyes of President George Manneh Weah, is the Liberian people. He said in as much as the Liberian Government welcomes an open and participatory market, it will not equally condone harmful business practices in the country. “Let the message go forth that the Ministry of Commerce and Industry remains committed to ensuring that anyone found in any business practice that endangers the health of the Liberian people will be made to account for their actions in accordance with law. The contaminated pig feet will shortly be burnt and disposed of. In another related development, the Ministry of Commerce and Industry has announced the discovery of an active and illegal practice in existence, involving the illicit issuance and or manipulation of Import Permit Declaration (IPDs) by local importers. According to Commerce Minister, Professor Wilson K. Tarpeh, the situation is seriously reducing government’s revenues and undermining the viability of local manufacturing companies in Liberia. He warned that the Ministry of Commerce and Industry is determined to protect Government Revenues and support ‘job-creating’ local enterprises, including the two local flour milling corporations, as well as other local manufacturers of nails, biscuits, candies, Insecticides and detergents. Minister Tarpeh also announced a number of measures aimed at addressing the matter. As part of the measures, all outstanding flour IPDs, both expired and unexpired should be returned to the Ministry for renewal and re-authentication, where appropriate. In accordance with the measures, BIVAC is mandated from issuing any Pre-shipment or Destination inspection numbers or permits; and that all illegally issued and still valid IPDs which are not surrendered to the Ministry of Commerce within 10 working days from the date of this publication will be automatically ‘voided’ and hence cancelled. “In this case, any commodity of such entering the ports of Monrovia under such IPDs will be denied Clearance,” Minister Tarpeh observed. He said inspectors from the Ministry of Commerce and Industry will begin a thorough and vigilant inspection of all import and other documents relating to the flour importation, including nails and other locally manufactured items as specifically emphasized, nails, biscuits, candies, insecticide and detergents, among others. The Commerce Minister also instructed that all importers are required to have in their possession for review, copies of IPDs, BIVAC CRF, and evidence of paid Customs Duties and other levies. 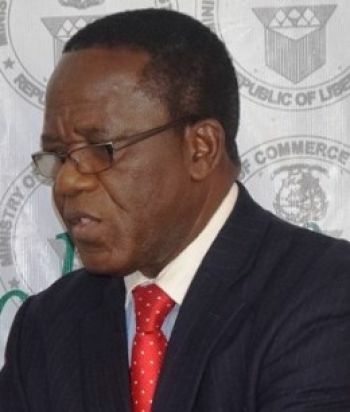 “The Commerce Ministry has concluded that any business (s) found to be illegally importing goods into Liberia, or in breach of these administrative regulations, will be subject to serious penalties according to the law,” Minister Tarpeh stressed. The penalties, according to Professor Tarpeh, include, but not limited to revocation of their Business Registration. He said these illegal IPDs have resulted in the flooding of the local market with low quality of essential commodities including, illegal imported flour, nails, eggs, biscuits and other basic products or goods with under-declared value, as well as smuggled flour. The Liberian Commerce Minister pointed out that all these illegal practices are depriving the government of legal revenues. He said another key issue is that many of the imported flour are being brought into the country with ‘expired’ IPDs.